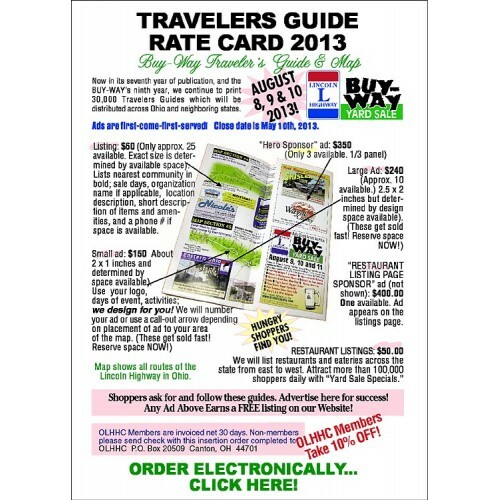 Reserve advertising space in the next Lincoln Highway BUY-WAY Yard Sale Traveler's Guide. We design for you! Upon receipt of order, we will contact you for your desired background photo or logos and discuss details (or you can contact us: sales@historicbyway.com). You will approve your ad design prior to press via emailed .pdf file. DEADLINE FOR ALL ADS AND LISTINGS IS MAY 10th! Please input you preferred contact method above. Click Here for more details about advertising. Click Here for more information about the Lincoln Highway Buy-Way Yard Sale.